WARSAW (12 December 2016) — Prologis, Inc., the global leader in logistics real estate, picked up two prestigious wins at the 2016 Eurobuild CEE Awards. Prologis was named “Warehouse Developer of the Year, CEE” and “Best Warehouse Manager of the Year, Poland” at the 2016 Eurobuild CEE Awards gala held 6 December at the DoubleTree by Hilton Warsaw Hotel. More than 900 real estate professionals from across Europe and the CEE region attended the event. The Eurobuild Awards selects the best companies of 2016, as well as the best projects developed or opened between October 2015 and September 2016. Prizes are given in four categories: Lifetime Achievement Award, Jury Awards, Tenant Awards and Popular Vote Awards. 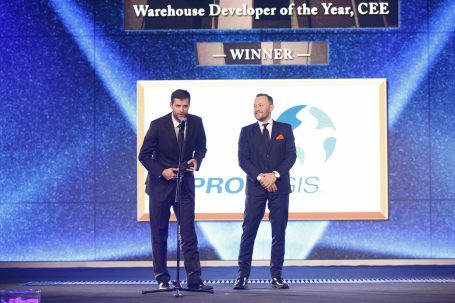 In the Jury Awards category, Prologis won “Warehouse Developer of the Year, CEE.” To date, 2016 has been the most active year for Prologis CEE since 2008. The company started 18 development projects totalling 331,000 square metres in core CEE locations; those projects included eight speculative facilities. Each new facility was submitted for BREEAM accreditation. In the Tenant Awards category, Prologis won “Best Warehouse Manager of the Year, Poland.” The award was given to Marta Kostyk, Prologis property manager in the Lower Silesia region. With its active engagement in four CEE countries and a portfolio totalling 4.4 million square metres, Prologis is the leading provider of distribution facilities in Central and Eastern Europe (as of 30 September 2016).